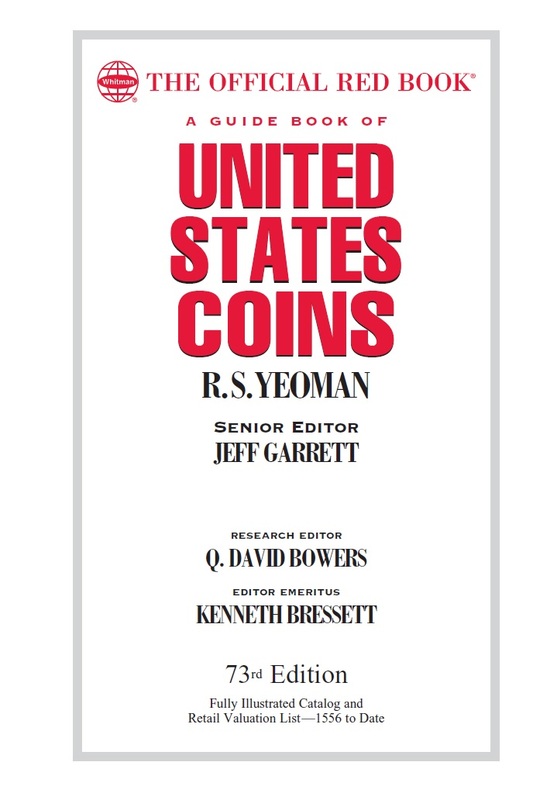 (Pelham, AL) — The newest edition of the coin hobby’s annual Guide Book of United States Coins (popularly known as the “Red Book”) will debut on April 9, 2019, two weeks before National Coin Week. The 73rd edition (with a cover date of 2020) features extensively updated pricing and auction data reflecting the current market for collectible coins, which has seen dramatic ups and downs in the past year. The Red Book can be pre-ordered online (including at Whitman.com) in several formats, and will be available from booksellers and hobby shops nationwide. The 73rd-edition Red Book is 464 pages long and prices nearly 8,000 entries in up to 9 grades each, with more than 32,000 retail valuations in total. Its panel of retail-pricing contributors includes more than 100 active coin dealers and market analysts with decades of experience. The book covers United States coins from 1792 to date, from half cents to $20 gold double eagles, commemoratives, and bullion, plus earlier coins and tokens that circulated in colonial times. The latest coins from the United States Mint—Lincoln cents, Jefferson nickels, Roosevelt dimes, America the Beautiful quarters, Kennedy half dollars, Native American dollars, American Innovation dollars, commemorative coins, bullion coins, and government-packaged coin sets—are kept up to date. The book also includes error coins, Civil War tokens, Confederate coins, Philippine coins struck under U.S. sovereignty, private and territorial gold pieces, pattern coins, Hawaiian and Puerto Rican coinage, Alaska tokens, So-Called Dollars, special modern gold coins, and other specialized topics. These are illustrated by 2,000 photographs, including enlarged close-ups of rare and valuable die varieties. The 73rd-edition Red Book features the Mint’s new 2019 commemorative coins. The Apollo 11 coins include a half dollar, a traditional silver dollar, a $5 gold piece, and the nation’s first three-inch, five-ounce silver dollar. These coins are all cupped in shape, with the reverse convex to recreate the view of Buzz Aldrin’s helmet, as photographed by Neil Armstrong on the surface of the Moon—with Armstrong, the U.S. flag, and the lunar module Eagle visible in the reflection. The new Red Book also includes the 2019 American Legion 100th-anniversary commemorative coins. The 73rd edition covers 125 more individual coin issues than the 72nd edition, and 14 new coin sets. Mintages have been updated across the board using the latest numismatic research and government-supplied data. The 73rd edition continues a section that debuted with the 70th, an overview of foreign coins that circulated as legal tender in the British American colonies and in the United States until the late 1850s. This section includes photographs, history, and pricing for collectible Spanish-American, Dutch, French, and English coins dating from the 1550s to the 1820s. Edits based on recent research can be seen in the pre-federal sections. The text for collectibles such as the Pitt tokens, Rhode Island Ship medals, Fugio coppers, Georgivs Triumpho tokens, and 1792 “quarter dollar” patterns has been updated. As in past years, collectors benefit from the Red Book’s recent auction records provided for significant rare coins. Typeset throughout the charts are nearly 200 notable auction results. Combined with the listed retail prices, the auction data help advanced collectors understand the modern market for high-priced rarities. In addition, the appendix of the “Top 250 U.S. Coin Prices Realized at Auction” has been fully updated. “This is the first year the Top 250 includes more than 100 auction sales higher than $1 million each,” observed P. Scott Rubin, the compiler of the records. “This is also the first year coins had to sell for more than $600,000 just to make the list.” The coin at #250, a 1792 No Silver Center pattern cent, sold for $603,750, which is $26,250 more than #250 in last year’s edition. In a positive measure of the health of the hobby and ongoing numismatic research, the Red Book’s newly revised and updated bibliography includes 37 standard references published within the past five years. The cover of the spiral-bound 73rd edition shows a mix of old and modern American coins: an 1850 Baldwin && Co. $10 Horseman gold piece; the 2019 Apollo 11 commemorative silver dollar; and a World War II–era Liberty Walking half dollar. All versions and formats (hardcover; spiralbound hardcover; spiralbound softcover; and Large Print) of the 73rd-edition Red Book will be available the second week of April 2019.